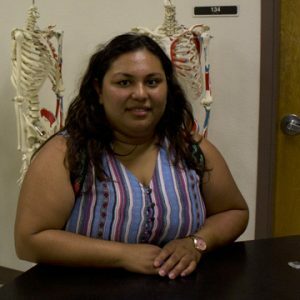 (HARLINGEN) – Ailina Rojas, 26, of San Benito expects to graduate in August 2019 with an associate degree in Surgical Technology. She currently holds a 3.6 grade-point average and aspires to attend medical school and eventually become a surgeon following her graduation from Texas State Technical College. I plan on finding a job in the Houston area, the “medical mecca” of Texas. Houston is a growing area in both medicine and technology, which would benefit me as a prospective employee. There are plenty of opportunities there that I am excited to pursue. My dream job is to become a surgeon. Graduating with my associate degree in Surgical Technology is the first step in that process. I have always known that I wanted to venture into the medical field, and while I was exploring the different programs at TSTC, Surgical Technology caught my eye. After observing a surgery, I immediately knew it was the right fit for me. Going back to school has been a challenge for my family since I have four kids. We have had to make many sacrifices, especially since my recent separation. I have had to assume the role of mom and dad and still pass my classes. Amidst this, I still made the dean’s list, so that’s something I definitely consider an accomplishment. I have learned recently about perseverance. Life can be tough at times, but never give up when it gets hard. That is when I learned the most about my own strength. Getting through school while supporting my kids on my own is a challenge, but it will pay off in the end. That is how I motivate myself. I have had great teachers across the board; no one in particular is better than the other. They are all helpful, and their various teaching styles are effective. Their hands-on approach is what I enjoy most. My advice is to be ready when you enroll. School is a huge commitment, and if you’re not willing to put your all in it, then what’s the point? But, if you are mentally ready for this commitment, then go for it. And remember, it is never too late to pursue your education. I am 26 years old and came back after having kids. If I can do it, so can you!